I think that this is a very subjective question but there are always certain things I look out for. Obviously I want a creative environment as I am going to spend a lot of time and energy there. I want the minimum amount of problems so good maintenance is essential. If tracking then good-sized well laid out spaces are essential with good visibility for everybody. A good mic selection is important with plenty of choice so I do not have to use mics because they are the only ones left. If mixing then good monitoring is the most important thing because at least you know where you’re heading. There are of course certain bits of outboard which I would always look out for, but at the end of the day you can always work with what you’ve got. One thing that is easy to forget is that the staff at a studio are just as important to a session running smoothly. Hopefully you get to work with someone who knows the studio inside out, who is friendly and attentive but knows when to keep quiet or give you space. Someone who can monitor the session and sort out problems before they happen and when something does go wrong they deal with it efficiently and effectively. So often assistants are bored and lazy. If you don’t already know what you want from a studio I’m guessing this question relates more to unsigned artists who don’t have much experience in the studio. Find a studio that fits all your requirements. You need somewhere big enough for everybody to work comfortably. 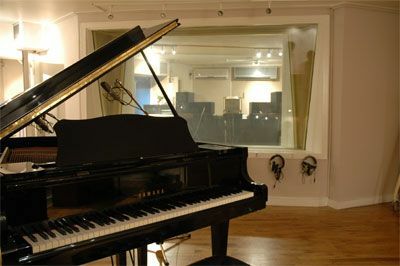 The live recording area’s accoustics should suit your sound particularly when recording live drums or strings. Are there separate booths so you can record simultaneously? Is there good visibility for all the musicians and engineer/producer? Are there separate headphone feeds so everyone can have their own mix? You may need to check the recording medium ie tape or hard disk, particularly if you have already started the project. Check the console fits your requirements and there is a good mic selection as well as plenty of outboard. Look for big names like Neve and SSL consoles; Neuman, AKG, Shoeps, Telefunken for microphones; Avalon, Summit, Focusrite, Massenberg, DBX for eq and compressors; and Lexicon, AMS, TC, for reverbs etc. Also check they have any extra equipment you might need, don’t assume they will have amps or keyboards that you can use. The most important thing to find out is who is going to be engineering the project. Hopefully someone will be recommended but remember a great engineer can get great results in a terrible studio but a bad engineer will make a great studio sound awful!! Use someone who has worked on things you like, someone with a lot of experience. Try and meet them before the session and play your demos you will be able to tell if they are the right person for the job. Remember the tracks are in their hands! Check that the studio is convenient for everyone to get to. Do they have parking? Is it a safe area? You can often tell a good studio when you walk through the door. Is it clean, is everything neat and tidy, are cables coiled and put away or is the place a mess? Are the staff helpful and interested, and do they give the impression they know what they are doing? At the end of the day, the most important thing is budget. Studio time is expensive so see if the studio will do a deal, can you bring your own engineer? Find out the cost of materials and can you supply your own. Are there extra charges for using their hard disk systems? All these things can mount up. Make sure that you are well rehearsed and organised. Have a schedule. Know when and where you are going and travel down the day before if necessary so you are relaxed and refreshed. Plan the day. If you only have one day to record and mix allow 30% of the time for mixing or you won’t end up with a finished record! Bring along references to check you are going in the right direction and the engineer knows what to aim for. Prepare! If you are a drummer check your kit is complete, tuned and you have spare sticks and heads. A choice of snares is useful if you don’t know the room, and lay some drums down and check them in the control room before laying down the master tracks to check you are happy. A good engineer will be able to help you with tuning etc. If you are a singer learn the words! Make sure you have a good headphone balance and get the engineer to listen to your cans in the booth if you are unhappy. Try not to sing too late and if you really feel like singing during the day try and put one down. A good vocal is essential to a hit record, a snare drum sound sadly is not. Also make time to set up a few mics to record a take on them all and choose the one that suits your voice best. The engineer will put up a u87 which is a safe bet but not necessarily the best for you. Remember you know what you want to sound like but take advice on which takes are best. Guitarists obviously bring spare strings and a tuner. You don’t want to be wasting £ 50 /hr going shopping for new ones. If you are bringing tracks to the studio which you have started at home on a hard disk recorder check all the files are well organised and the studio has a compatible system. Maybe try to send the files in advance so they can be checked. Overall try not to work too many hours , it doesn’t help to do more than a 12 hr day. You might cope but the engineer will need to rest his or her ears, so budget sensibly. The engineer is the intrerface between the musician and the reording medium. You pay peanuts and you get monkeys. With a great engineer everything sounds great all the time, they are attentive and helpful and keen to try things and the session runs smoothly. With respect to what format to use most recording is done to hard disk. Nowadays it sounds great, 24bit 96k pro tools is fantastic. Logic Audio is also a favorite with programmers as the sequencing side of things is very good. When using digital mediums some people try to use good valve mics, eqs etc to keep the sound as warm as possible. Tape although sounding great is hard to buy, tape machines are not used so not always well maintained and rewinding is a bore. The difference in a studio unlike working at home is that it cost a lot of money. Apart from that everything should sound better, mics and recording areas should sound clearer but to be honest for some types of music particularly dance music it is no surprise that more and more tracks are done at home as computer mixing gets more and more powerful. As far as production goes enjoy music and believe in what you’re doing. Always listen to your instincts. 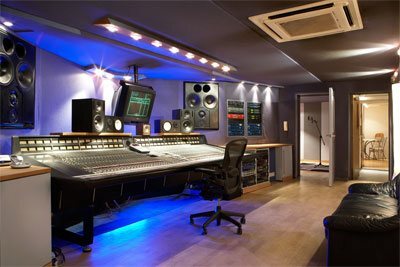 With mastering if you are signed the record company will want to master at their usual room as they will be getting a good rate. Don’t judge the acoustic too much, I’ve never been in a room that sounded right but hopefully the engineer will know it inside out. Get all the gaps right then take it away for approval and listen on system which you know well. The mastering will always need tweaking so don’t be afraid to make changes, you will know the tracks intimately whereas the engineer will be hearing it for the first time.